As a meeting planner, you want to boost audience engagement and collect as much feedback and data as possible. Audience response systems (ARS) help you accomplish both. During live events and conferences, audiences can interact with hosts, speakers and vendors with your event app, placing votes, responding to polls and participating in the action — all in real time. Let’s walk through how to make the most of ARS. Audience polling has come a long way from a show of hands in the crowd. 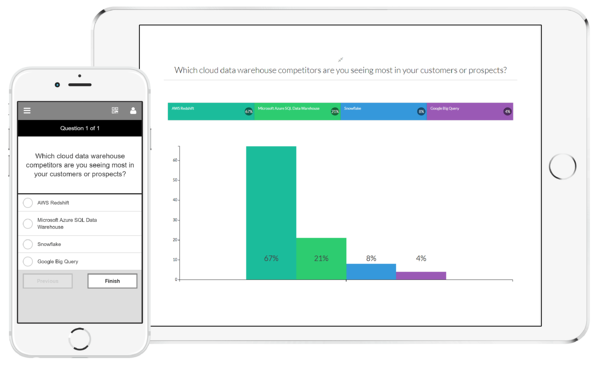 For example, with an event polling app presenters can ask the audience, “How long have you been with the company?” Attendees open a poll in their event app and select 1 year, 1-3 years, 4-5 years, or more than 5 years, and the results will appear immediately in the speaker's live presentation. Polling questions are usually done in multiple choice response question format, ensuring that results can be charted and integrated into the presentation in real time. If you want to mix it up, you can ask an open-ended question and generate a word cloud on the spot. We recommend asking your attendees a question that calls for a one-word response. 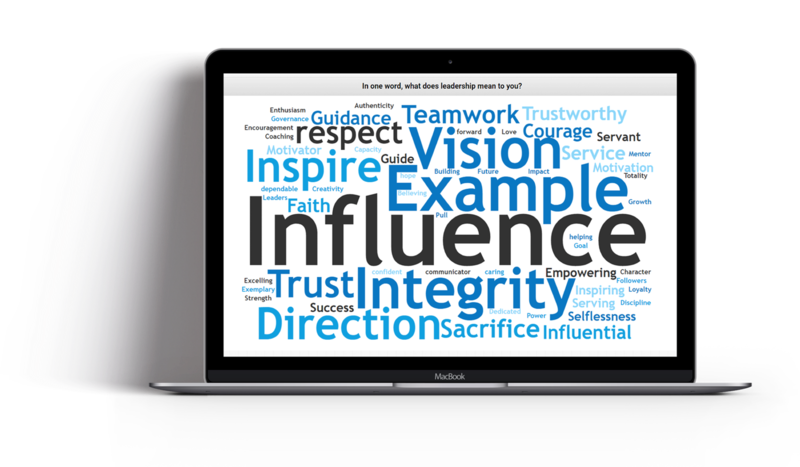 For example: “What one word comes to mind when you think of our brand?” As the responses roll in, it’s collected to create a cloud image, with the most common response appearing in the largest text size. Each word’s size indicates its frequency, creating an intriguing and impactful visual. Cllients love using these polling systems for presentations on stage. A mobile app makes surveys super simple and efficient. Surveys can help you gather info on all types of things: food options, the event location, the registration process and anything else you want to get a read on. We usually recommend that our clients send out short, high-frequency surveys and incentivize them with gamification (along with rewards). Send a notification and reminders as needed. With a MeetingPlay app, you can plan and develop everything you need for your surveys beforehand, so the whole process runs smoothly. Attendees are usually up for a challenge. A quiz in their app is perfect for a quick knowledge check at the end of a training session or after a new product rollout. To ensure participation, add them to your gamification plan so that attendees can gain points for correct answers. Your event app can also help streamline audience Q&A sessions. A live questions app feature allows attendees to ask questions through the app polling system, saving your speaker time passing the microphone around the room. It can also makes sure that everyone who wants to ask a question gets a chance. If you want, you can also elect a moderator to comb through the questions as they come in, and pass the most relevant and interesting ones on to the speaker/host. Questions that are made “public” can be voted on. This is a fantastic way to generate peer interaction and audience engagement. Your moderator can keep an eye on which questions receive the most votes and pass the most relevant onto the speaker. In addition to handling questions in real time, MeetingPlay’s back-end reports include email addresses of those who ask questions so you have the option for post-event follow-ups. Event voting can be similar to event polling (with a publicly viewable responses) or it can be a secured as official voting. 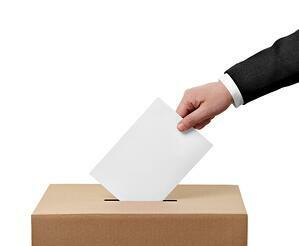 Often, our clients calculate votes to elect or nominate potential leaders, so they want a secure mobile voting system. With MeetingPlay, you can design an audience voting app so that everyone in a room can see and reply, or design voting so that only certain people can see and respond. A good app is flexible enough so that you can choose exactly who participates and views results. 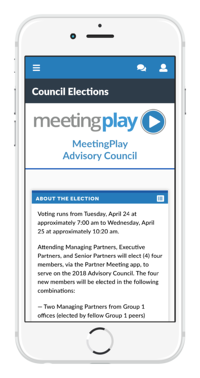 To demonstrate how you can use ARS voting, let’s walk through a quick case study of a MeetingPlay client. The client holds an annual conference where thousands of business representatives come together for learning and networking. At each conference, they elect next year’s board council, each from a different district throughout the country, totaling 11 elected council members. Historically, the client conducted voting with paper ballots; a different ballot for each district. Not only did this method require daunting amounts of hours for distributing and counting votes — it also required all event attendees to remember to fill out a paper form during an already busy week of events. 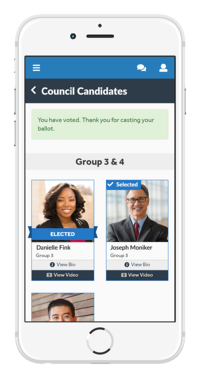 The client used secure voting within the their MeetingPlay real time voting app. This allowed attendees to access only voting for representatives from their district, eliminating confusion. Additionally, the ARS voting allowed the event planners to turn voting on and off at specific times, as well as send alerts and reminders to attendees if they had not voted by a certain time. The voting results were secured through a back-end database with access only available to pre-defined individuals. This approach to voting was so secure that it exceeded the requirements of various meeting rules and protocols. In the end, our client was able to accomplish three main goals by utilizing a live voting app. 1. Event app adoption rates were 200% higher than they had been historically. 2. Reporting and calculating results was automated and exact, reducing previous event planner time spent by over 400%. 3. Our client was able to increase post-event engagement by over 138% by offering the elected district representative results within the app. Needless to say, the client was thrilled to leave paper voting in the past. "We knew we needed a solution different than our traditional paper voting systems,” the client said. “One that guaranteed security, but would also provide engagement opportunities. MeetingPlay's mobile event app provided our conference with both! We're thrilled with the results, especially the reporting!" To take advantage of ARS and an advanced event app, contact us to schedule a demo!